The 1990s were a formative decade, and if you were a kid in the ‘90s, with no Internet and no smartphone, Saturday morning cartoons were your jam. With the announcement of the Animaniacs reboot, we wanted to look at the most popular kids cartoons from the ‘90s. 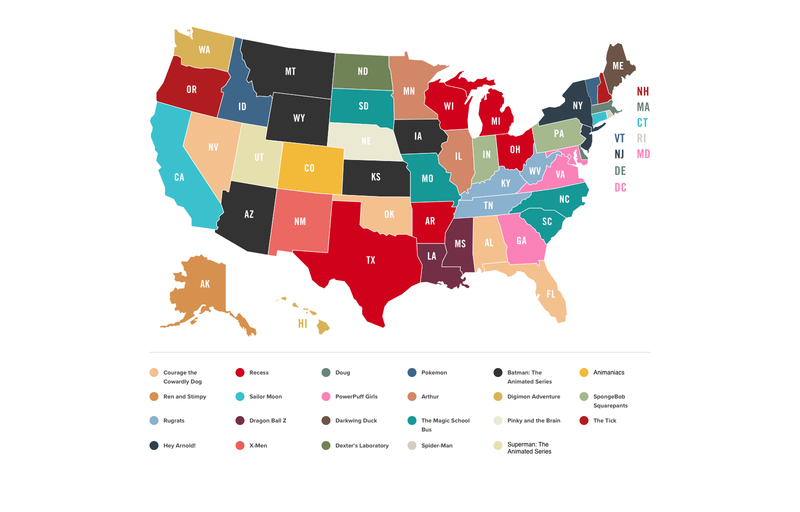 Can you guess the most popular show from your state? Batman: The Animated Series is the most popular ‘90s cartoon. No? You guessed The Simpsons, right? We did, too, but The Simpsons debuted in December 1989. So close! We found, though, that Batman: The Animated Series is often ranked just behind The Simpsons as the best animated TV show of all time. Two people are responsible for the most cartoons on the list: Joe Ansolabehere and Paul Germain. They are the brains behind Recess, Rugrats, and Hey Arnold! Recess takes second place, Rugrats comes in at number six while Hey Arnold! comes in at number ten. Anime, or Japanese-style animation, was also popular in the 1990s. Dragon Ball Z, Pokemon (Indigo League), Digimon: Digital Monsters, and Sailor Moon all rank in the top 15 of most popular ‘90s cartoons. Other 1990s cartoons considered most popular include: The Magic School Bus, Powerpuff Girls, Courage the Cowardly Dog, SpongeBob Squarepants, Doug, Arthur, The Tick, Spider-Man, Ren and Stimpy Show, Pinky and the Brain, X-Men, Superman, Dexter’s Laboratory, Animaniacs, and Darkwing Duck. Yes! There are ‘90s Cartoons Still Going Strong! SpongeBob Squarepants remains popular today, and is also a Broadway musical. Yes, a Broadway musical, and it has even been nominated for 12 Tony Awards®! 12, including one for Best Musical, and one for Best Original Score. All of the superhero shows that made the list now have live action films of their own, including Superman, Spider-Man, Batman, and X-Men. Pokemon has mastered reinvention and stayed relevant with dozens of new shows and movies, not to mention the very popular iOS and Android game Pokemon GO. Do You Have a Favorite ‘90s Cartoon Reboot? The Animaniacs reboot is only the most recent. Other reboots of ‘90s cartoons include the Powerpuff Girls, The Tick, and the Magic School Bus. Will there be more? Only time will tell. Surprised? Filled with nostalgia? Scratching your head over a particular cartoon? Tell us! We’re interested to know your thoughts, and what you expected to be the most popular 1990s cartoon. We used IMDb to generate a list of the top 25 most popular and highest rated cartoons that were released in the United States during the ‘90s. Since we wanted to focus on the nostalgic kids shows, we excluded any show with a rating of TV-14 or higher, which means that shows like South Park and Family Guy were excluded. From there we analyzed Google Trends data from the past year to identify the shows that stand the test of time–which shows are people still searching for after all these years? The results were indicative of each state’s favorite ‘90s cartoon.